The biggest shock of the Sharman Burgess Sport Cup saw Division Three Northgate Olympic beat Premier Division Old Leake 2-0. Also in round two, there were three all-Premier League games. 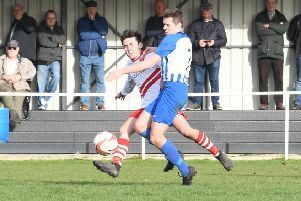 Spilsby Town beat Coningsby 2-1, Skegness Town Reserves beat Pointon 3-1, their goals coming from Jordon Smith, Daryl Read and Owen Howard, and Fulbeck United beat Swineshead Institute 5-3. Railway Athletic progressed with a 4-2 victory against Division One Fishtoft. Alex Cammack scored all three as ???? defeated Freiston. Friskney beat JFC Seniors 5-0, Victor Sibert with a brace, Greg Brown, Jobe Stainton and James Delorenzo also on the scoresheet. Bull Athletic put six past Holbeach Bank without reply. Benington had a excellent 4-2 away win at Wyberton in the Workforce Unlimited Premier Division. Ruskington Rovers beat Kirton Town 2-0, the Ruskington goals coming from Jake Ellis and Sam Jackson. In Division One, Woodhall Spa beat local rivals Billinghay Athletic 4-3 while Boston College and Horncastle Town Reserves shared the points in 1-1 draw. Pointon Reserves came away from Swineshead Reserves with all the points as they won the game 3-1. Division Two saw Caythorpe claim an excellent win against promotion-chasing Railway Athletic Reserves, winning the game 4-1. Third-place Skegness Town A beat Coningsby Reserves 3-1, Josh Whittam, Dan Starkey and an own goal giving them the points. FC Wrangle and Boston Athletic settled for a goalless draw. Digby and Fosdyke Reserves hit the net 11 times between them in Division Three as Digby won the game 7-4. Benington Reserves beat Park United Reserves 3-1 to finish off a good day for the club.